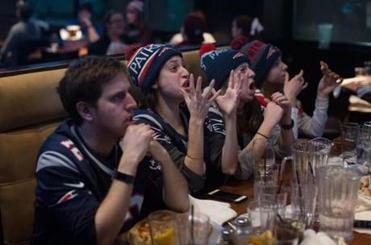 Six people were arrested and 12 were transported to hospitals as approximately 2,000 people gathered in a large, chaotic group on the University of Massachusetts Amherst campus Sunday night after the Patriots’ 41-33 Super Bowl loss to the Philadelphia Eagles, according to a university spokesperson. The gathering was so large, officers used pepper spray to disperse the crowd and State Police troopers in riot gear were called in to help, officials said. The crowd control measures came after campus police reported that fights had broken out in the Southwest residential area after the game ended, and that people had set off firecrackers and smoke bombs and were throwing objects, according to a UMass statement. Late Sunday, university spokesman Edward F. Blaguszewski said there was “certainly a gathering,” but did not call it a riot. In an e-mailed statement sent early Monday, he said cases were still being processed and he did not know if the people arrested and injured were students. “The medical calls included head injuries, lacerations, and alcohol intoxication,” Blaguszewski said in the statement, citing the Amherst Fire Department. That optimism and confidence — along with the lead — soon evaporated, as the Eagles stormed back. Officials issued “multiple” dispersal orders to the crowd, but used a pepper spray projectile called PepperBall after people lingered, Blaguszewski said. The area was cleared by 11:30 p.m.
On Twitter, users posted videos and pictures depicting a chaotic scene with prevalent police presence. One video tweeted by The Massachusetts Daily Collegian, the school’s independent student newspaper, showed dozens of chanting students gathered around what appeared to be a fire as officers tried to disperse the crowd. Officials could be heard telling those gathered, “You are all subject to arrest,” in between ordering students to go indoors. More than a dozen State Police officers in riot gear and at least three officers atop police horses could be seen in the video. State Police spokesman Dave Procopio said troopers assisted at the school in Amherst, as well as in Dartmouth and Boston. Amherst police were also at the scene, according to Blaguszewski’s statement. In other photos posted on Twitter, UMass police could be seen putting handcuffs on at least one male. Caroline O’Connor, a UMass senior and photo editor of the school’s student paper, was taking pictures of the calamitous crowd Sunday night. “It seemed like there were hundreds of [students], and they were screaming,” O’Connor said. She said she saw police in riot gear arrest a young man who had tipped over a trash can, dumped it out, and threw it. Students set off fireworks and threw beer cans at some of the dormitory buildings, she said. 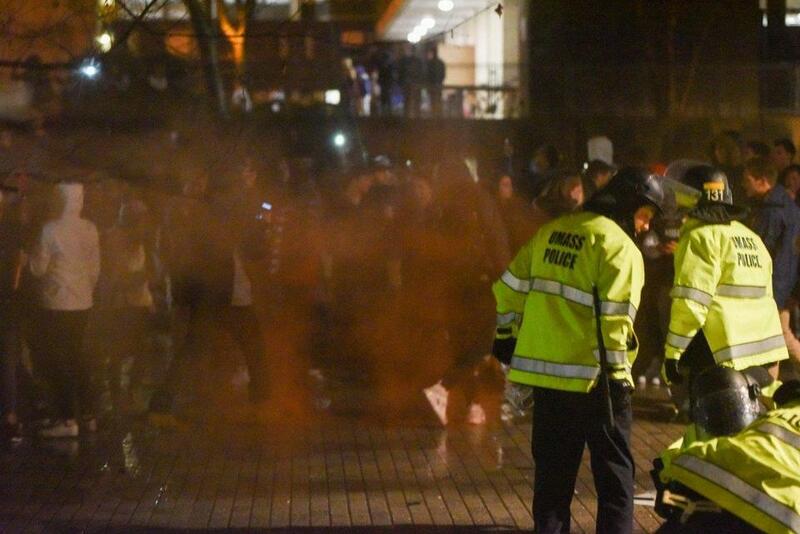 In 2012, police dispersed about 1,500 students with smoke grenades after the Patriots lost the Super Bowl to the New York Giants. Warning: Some videos may contain graphic language. 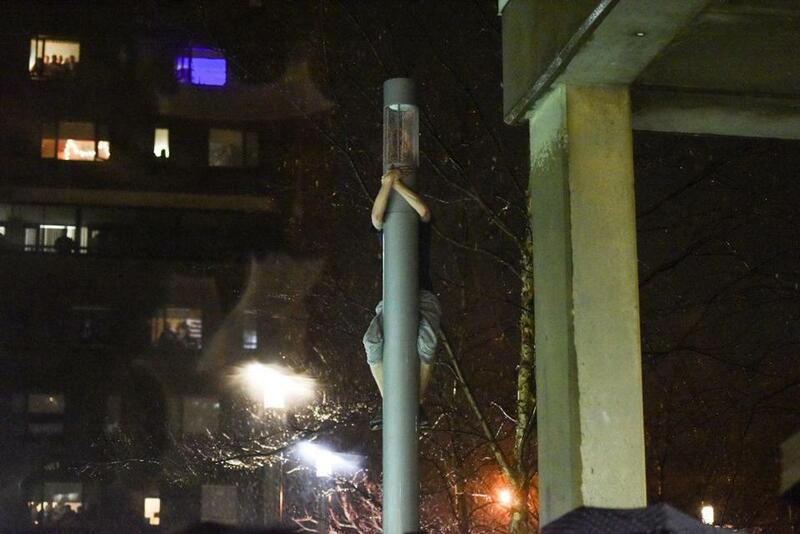 A person climbed a pole at UMass Amherst.